The Galaxy ceiling fan by Brilliant Lighting is a unique, 3 blade, propeller style ceiling fan with hand carved blades. 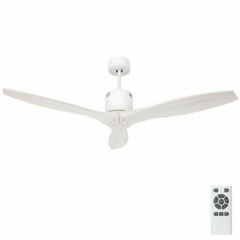 The fan has a 54″ blade span and is available in four attractive finishes; Satin Nickel, Antique Bronze, Silver and White. 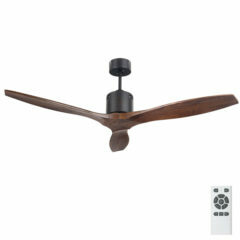 The Galaxy ceiling fan is a beautiful fan with an elegant presence that would add style to any room. Energy Efficient DC Motor (36W). 3 x Handcrafted Solid Timber Blades. 20 degree (average) Blade Pitch. 32 degree max Ceiling Rake. 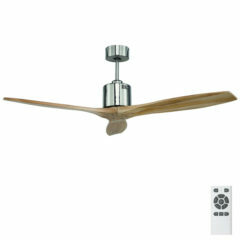 The Galaxy II ceiling fan features a unique 3 blade design with an energy efficient DC motor utilising 5 speeds. It also has reversible settings for summer and winter use via the included remote control. The Galaxy has three solid timber blades in antique bronze. The Galaxy II ceiling fan features a unique 3 blade design with an energy efficient DC motor utilising 5 speeds. It also has reversible settings for summer and winter use via the included remote control. Solid timber blades in white. 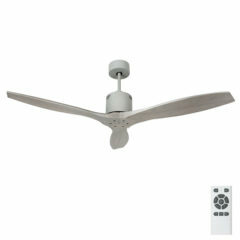 The Galaxy II ceiling fan features a unique 3 blade design with an energy efficient DC motor utilising 5 speeds. It also has reversible settings for summer and winter use via the included remote control. This model of the Galaxy has three solid timber blades with a natural finish combined with a satin nickel motor.